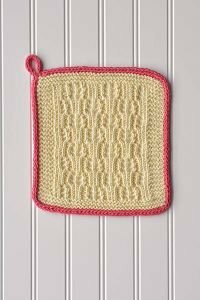 Each of the 5 classes in this series will net a lovely wash cloth knit with 100% organic cotton, perfect for the 'wash 'n wear' needed for such an item. There are different techniques in each cloth, perfect for improving our skills, and each is finished with an I Cord binding that ends in a loop for hanging. A quick project that's great for using or gift giving!